This page is for volunteers sign-up. FANS: Click here to join the fans emailing list instead. AGAIN - This is for VOLUNTEERS sign-ups, NOT RIDERS. FANS/RIDERS: Click here to join the fans emailing list instead. Just answer a few simple questions and confirm your email. Then you'll be added to the Support Email list and Support Facebook group and optionally TheChainLink.org and GroupMe. Already signed up? Login now or get a password reminder. See the meetings and orientation schedule here. Attend to win t-shirts! Wanna help? Check out the ToDo list and pick something. Read the ABOUT page and know the ride rulez. Save the booze for after. Keep passages clear at lot. Direct bike parking at lot. Keep the peace at lot. Watch the lot and people until party winds-down. Keep it cool, prevent escalation, be friendly but firm. Dismiss disputes quickly: "Please visit the recommended viewing point (TBA) or website. Thanx for your interest, have a flyer, be well, next." Visible open alcohol is THE SINGLE MOST COMMON bike bust. And drunk naked cyclist is a worst possible combo. We can drink to our hearts' content AFTER THE RIDE but be responsible please before and during. Tell anyone seen with booze "If I can see it THEY can see it." Alerts - Use whistles, shouts or phones. Grumps - Give info handouts and smiles. Remind them how great the moment is. Diffuse and move on. Creeps - Gently block. Speak to their better nature. Imply they're being videoed. Stay as needed. Minor Disputes - Attract Friends. Be nice. Video. Stay as needed. Ragers Drunks Loonies - Attract Friends. Defend but don't touch. Video. Stay as needed. Dangerous Riders or Spectators - Alert a team leader. Watch. Alert police. Stay as needed. Minor Accidents - Pause to assist. Assess for injuries, shock, sobriety. Notify Friends. Stay as needed. Options include resuming, bailing, cabbing, and pedicab rescue. Emergencies - Attack by spectator, serious accident: Alert police or ask a Friend to. Get info and video. Await help. Police Contact - Alert Legal Team or ask a Friends to. Don't escalate. Obey commands. Stay quiet. Unconsciousness - Call 911. Alert team leaders. Await help. Basic Medical - Alert Team Leaders. Basic first aid supplies and skills are available. Volunteers with medical skills make sure to exchange numbers with team leaders. Mechanical Failures - Alert Team Leaders unless you have necessary skills. Basic bike maintenance services are available. Remain as needed (possibly permanently). Volunteers with basic tools and skills make sure to exchange numbers with team leaders. Friendly volunteers staff the screening point where participants first arrive. That's an offsite location whose address is widely announced. Candidates MUST show person-powered wheels. Send others to recommended viewing point(s) and time(s) (TBA). This "person-powered wheels" requirement is widely published, no exceptions. Exact directions from check-in to gathering spot are TBD. The directions must be clear and exact, but the adventure is part of the fun. Check-in volunteers read the ride guidelines handout thoroughly for reference. BE VERY CAUTIOUS about stray copies of map or directions at check-in. Mass typically passes check-in upon departure, check-in staff and stragglers can merge in then. Yes: Bikes, skates, skateboards, pedicabs, other people powered wheels. No: Jog (unless REALLY convincing), Segway, gas assisted bikes, anything else. Also challenge candidates who are fully dressed, discuss the ride's meaning and their options. Dismiss disputes quickly: "Please visit the recommended viewing point (TBA) or website. Thanx for your interest, have a flyer, NEXT!" Many fully clothed obvious non-cyclists will arrive on foot and bluff hard. But anyone not aware of the policy either didn't read anything, is problematically dim, or is lying. From About: "Location is not disclosed to limit crowding of the creepy variety. If you plan to come just to look and hope to bluff your way in, make other plans. If you show up there without bike/skates, or with a camera, and say you didn't know or that someone said you could or feign language trouble, you will be laughed off premises." Several close Friends typically loiter at the pre-gathering area's main entrance. These people hand out maps, advise participants to read the guidelines, and direct non-participants away. Greeters may give ride gifts (whistles, stickers, bubbles, etc) and answer basic questions such as how to donate online, but as of 2014 we're no longer dealing with cash. Non-participants that slip by or are flagged by greeters should be addressed by other Friends. As of 2017 NOBODY is authorized to photograph inside pre-gathering and afterparty (if any). This has been a major contributor to our large turn-out, as opposed to other big cities where it is a top problem. ANYONE UNKNOWN with camera at pre or post events should be told to put it away immediately. Expect several with major equipment who will bluff hard. But anyone not aware of the policy didn't read anything, is stupid, is lying, or all three. Worst case, tell them to go take photos outside the fence. Suggested reproach: "Don't be a creep. Do everyone a favor and put away the camera. Just enjoy the ride, and go see the official photo albums later." From About: Can I come take pictures? NO. Event photography/videography is already well handled and no new applications are considered. As stated in ride guidelines: NO photographs allowed before ride in mass preparation area except by identified authorized personnel, and no photos whatsoever at private after events if any. This policy is safety team and participant enforced and subject to ejection. Furthermore photography by participants during the ride is strongly discouraged for safety and the comfort of others. However, participants MUST assume by participating that they may be photographed by spectators. To limit our total time at gathering spot, and to address problem years where body painting still had a long line at departure time (which then caused departure to be delayed) it is planned to begin closing painting a half hour before departure, well before sunset. That gives the painters a little time to get ready to go, and some time to shutdown that station. AIRHORN cues may be used at intervals over the course of the evening to mark the passing of time. Multiple blasts will signal imminent departure. SUNSET (~8:20pm) means we're LATE for departure. Plan to rally and start circling in due time to ACTUALLY DEPART as sun sets. Departure time matters for WNBR-C because we announce viewing point times. Volunteers not present and ready at that time (with few exceptions) may be left behind, but can catch up. Exchange phone numbers with others on your team. Also a quick reference of critical phone numbers is distributed to some Friends. Optionally follow @ChiNakedRide on Twitter. And/or #WNBRC hashtag. Limited numbers of radios are available but some have limited distance, and others are fabulously expensive. ALL CAPABLE take a map and responsibly perform corking and guidance. 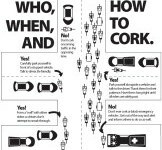 See the the Chicago Critical Mass "How To Cork" handout. Andrew recommends: In case of car traffic control trouble VISIBLY to the driver take a flash photo of license, or video of problem drivers as soon as possible. This makes drivers suddenly aware they may be held responsible for their actions, and worst case makes that possible. Tell them to be cool, that it'll be gone in under ten minutes, and how lucky they are huh?!? 1. Recommended safety vest. Under $10 (formerly?) at Target in camping or automotive. 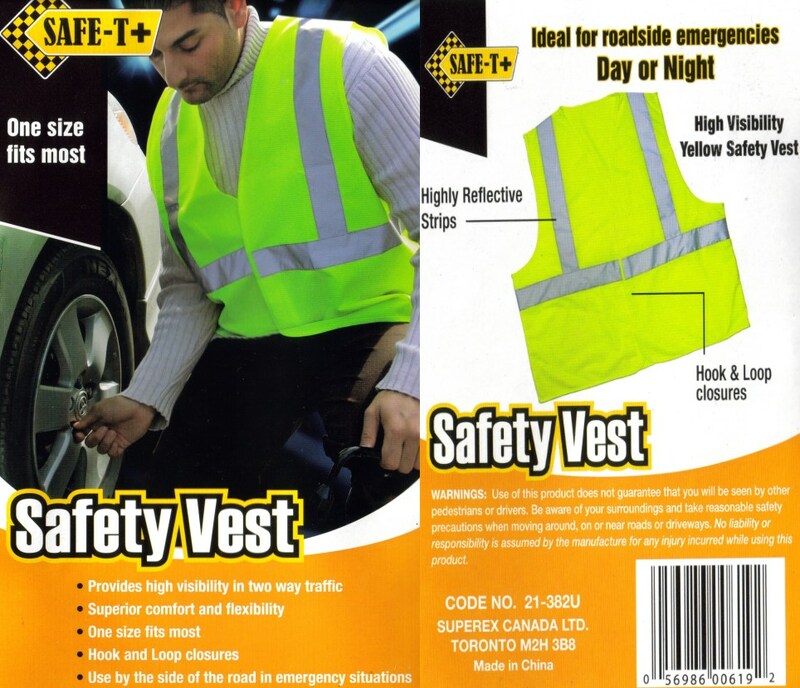 "Safe-T+" Safety Vest. Either green or orange is fine. Green is a WNBR-C theme color, but orange seems more conventionally visible. They're adequate quality, very shiny, back same as front. 2. A number of these are already in ride equipment inventory, but chaperones and route volunteers consider owning your own. Online sources for similar: AlertShirt and SafetyLine and Amazon. 3. Alternately, orange and green UV body paints may be available on site for limited use painting safety markings onto yourself.